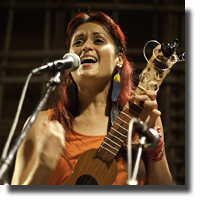 Las Cafeteras is a big hit tonight! Bravo! I love the exuberance in the Afro- Mexican rhythms. Some band members speak from their hearts and tell us of the things that they feel moved them in their lives. They give the audience hope, inspiration and share their stories of coming from the streets of Los Angles. “If you can dance, then you can sing, and if you can sing then you can do and become anyone you want to be.” “Just believe in yourself”. They speak of present political issues. They tell of HOPE and the dream of bringing an end to corruption. Their sound is a mix of rock, hip hop and the exciting sounds of Mexico. This Land is Your Land starts slowly like the traditional version and then the tempo increases to an almost frenzy, much to the delight of the audience. It’s a packed house and the audience fills every space in the theatre. Candles on every table add warmth and a romantic ambience to this successful performance. Some of their instruments are new to me such as a donkey jawbone, a West African instrument called the Marimbol, cajón jarana, requino, and a raised form of wood that magnifies the sound of their stomping feet. It is called a Tarima. Believe me, there is a whole lot of stomping going on and the stomping elevates the excitement of the crowd. Almost every person on the dance floor is jumping up and down (including me). People are friendly and enjoying each other. The staff at Performance Works did a great job setting up the theatre. I had a great time, met some wonderful people and danced off some calories. A wonderful evening was had by all. My compliments to all of those who worked so hard to make tonight’s event a great experience.